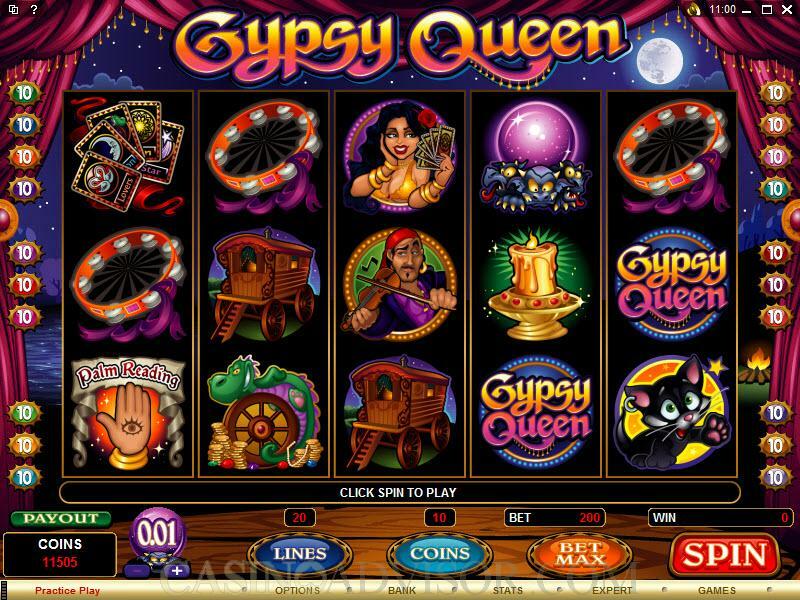 Gypsy Queen is a slot game featuring, of course, a Gypsy theme, with five reels, 20 paylines and a maximum bet of 200 units. It has a scatter symbol, in the form of a "Crystal Ball.". 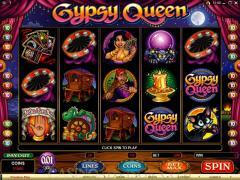 Gypsy Queen is a slot offering designed and developed by Microgaming, known worldwide as the leader in online casino software. The scatter symbol, as mentioned, is a "Crystal Ball,". 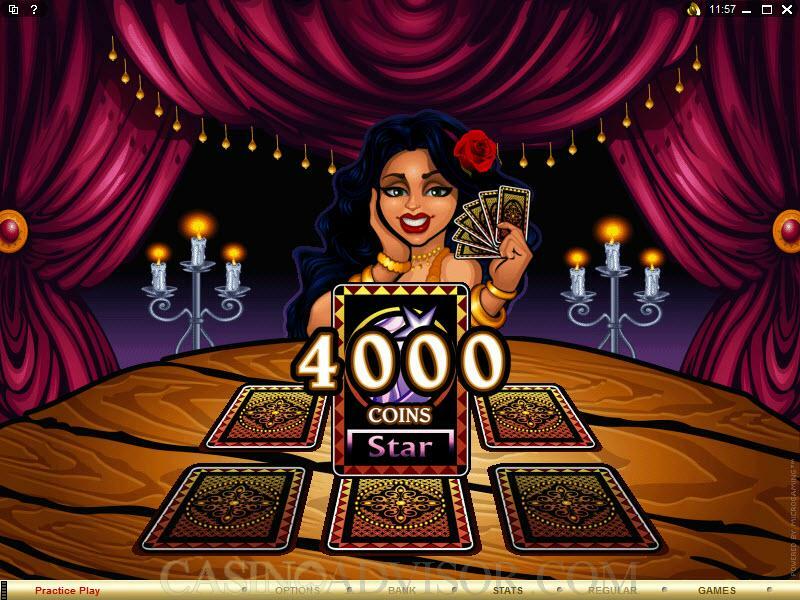 and when two or more of them are scattered from left to right on consecutive reels (where one of them is on the first reel), one of two bonus games is activated - either the Free Spins Game or the Tarot Card Game. Gypsy Queen is activated when one clicks the "spin" button, but before that happens you have to make a couple of adjustments. You must set both the number of coins that will be in operation and the number of paylines that will be activated. You can obviously activate up to 20 paylines before you spin, as well the maximum number of coins, which is ten. You can also adjust the size of the coin denomination, which runs in increments from .01 to .02 to .05 to .10 to .20 to .25 to .50 to $1. If you just want to bet the maximum amount, click "Bet Max" for whatever coin size you want. If you look at the bottom left-hand size of the interface, you will see a green "Payout" button. You can click on this to go to a series of payout tables, which outlines the regular payouts, the bonus returns, and the scatter payouts. 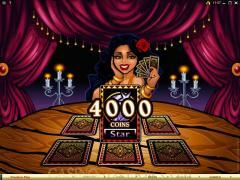 The Tarot Card Bonus Game allows you to win up to 30,000 coins. When it is activated, you will have a choice between six different cards that are displayed on the screen. There are various bonus amounts under each card, so when you select one of them, it is flipped and that is the bonus you win. Simple. The Free Spins Bonus Game awards up to 30 free spins, triggered by the appearance of the Crystal Ball scatter symbol. How many free spins you get depends on how many Crystal Balls show up. Two of them will bring 12 spins; three yields 15 spins; four brings 20 spins, and for five Crystal Ball symbols you will receive 30 free spins. All wins in the Free Spins Bonus Game are tripled. Interested in reading more detailed information about Gypsy Queen? If so Click Here for more details.